When it comes to creating a business card, it’s all too easy to put a few details onto a plain piece of card and hope for the best. But if you want to create a business card that wows, you’re going to have to do more than that. You see, having a business card that stands out and works harder than just a slip of paper with your contact details on is so important. It gives you the edge over your competitors and ensures new contacts remember who you are and where they met you. So what makes an effective business card? Essentially, there are three key elements: a concept, a design, and a message, all of which come together to create something that leaves a lasting impression. If you’re ready to make that wow-factor business card, here’s how to bring everything together. The sole purpose of a business card is to transfer contact details from one person to another. But it’s really tempting to put every single detail on there. When you do this, though, you have an overwhelming amount of information packed onto a tiny little square which can be confusing and off-putting for recipients. Adding in social media handles gives recipients the chance to connect with you in a more passive way, which means you can start building relationships with them that are less direct that email. A lot of people make their business cards look good to them. They choose the colors they want, the fonts they want, and essentially create a design that suits them. But remember the final destination of your business card: your recipient. They might have different tastes or expectations. When you think about who you’re giving your business card to, you can craft a message that taps into their pain points and serves their needs rather than creating something that you simply think is pretty. And remember here: you can’t speak to everyone at once. It’s easy to want to create a neutral business card that’s suitable for everyone, but this often appeals to no one. Think about the journey someone takes once they receive your business card. It’s likely they’ll have a look at your website, check out your social channels, and eventually send you an email or give you a phone call. In order to make this journey as smooth as possible, you want to keep every step on brand. That means using brand colors, fonts, and taglines that are consistent with your website and other materials so recipients can make quick connections when they look you up. This also ties into employee branding. If you’re creating a set of business cards for a number of different employees, you can connect them all together with company branding while adding it personal details to make them individual. At business events there is usually a lot of business card swapping. That means people end up going home with stacks of cards that, let’s face it, often sit getting dusty on their desk until they can be bothered to chuck them away. This is why it’s important to have a business card that stands out in a pile of others, and the best way to do that is to get creative. Instead of just putting your details and brand colors onto a regular square card, you might want to spice things up by trying out the latest business card trends. You can give the edges a colorful paint wash so they stand out when they’re in a stack, or you might choose to die-cut your card into a weird and wonderful shape. Earlier we mentioned not putting too much information on your card, and the same should go for design details, too - you want people to actually be able to read your business card. Minimalism is on trend in the design world at the moment, which is perfect for making a good, strong first impression without overwhelming the recipient. Remember, they’ll likely have loads of business cards to sift through, so if yours is easy-to-understand and focuses on just the key details, you’ll be more likely to get an email. Think for a moment about the lasting impression you want your business card to have: how do you want recipients to think about you when you’re no longer talking to them? Consider a professional law firm that uses a cartoon font on their business cards and clashing bright colors. That’s unlikely to send out the professional, elegant vibe the company is hoping for. This is why it’s important to choose a design that fits your brand and message; if you’re a playful business, feel free to go crazy with color and other fun elements, but if you’re a corporate business that relies on professional connections, you’re better off keeping things neat and smart. Yes, your business card should be a physical transaction of contact details, but the possibilities are endless. When you consider that 88% of business cards get thrown away, standing out has never been more important - or, at least, giving your business card that extra edge so that people don’t want to throw it away. There are plenty of ways you can give your card more than one purpose, like adding a list of industry tips on the back, have it turn into a paper airplane or a tiny desk box, turn it into a name tag or use any of these unconventional ideas. This will make recipients more likely to remember it and, most importantly, less likely to throw it in the trash. Contrary to popular belief, business cards don’t have to be rectangular pieces of card - they can essentially be anything you want them to be! When choosing your specifications, make sure they align with the message you want to send out and the audience who will be receiving them. Specifications can mean everything from what size you want your business card to be (though bear in mind that most people will put them straight in their pockets), the orientation of the card, any custom cuts, and the material you will use. It can be difficult to streamline making large quantities of personal business cards for a company. By using a service that makes it easy to replicate the process can save a ton of time and energy. With Brandly, HR departments and CEOs can upload their business card designs and store them on-site to edit and change later on for new employees. This avoids the hassle of having to create a new business card from scratch each and every time a new employee joins. It also means employees themselves can log in and edit in their own details when they need a new set of business cards. 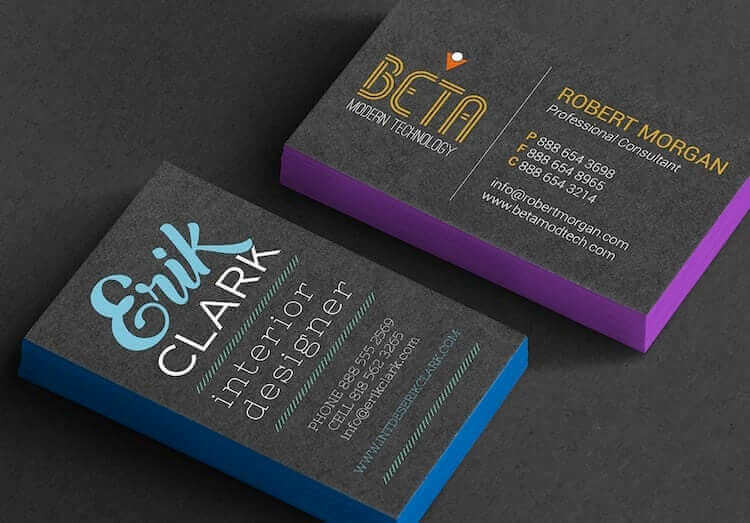 A business card that wows leaves a lasting impression. Once you’ve chosen your specifications, the message you want to send out, and a design that reflects the rest of your brand, it’s time to add the finishing touches because, after all, the beauty is in the detail. This means ensuring your business cards have the perfect finish. Getting them professionally printed can mean the difference between your business card being eye-catching or amateur and forgettable while making sure it’s readable means you won’t miss out on people contacting you because they don’t understand your details. Your business card is so much more than just a piece of paper with your contact details on. You could almost say it’s an extension of you and your business, and by making sure you reflect that in the design and concept, you’re giving your card the best chance at standing out in a sea of others. People leave business events with business cards flooding their pockets, most of which will get thrown away before they’ve even properly looked at them. If you want to make sure yours isn’t one of those, keep it simple but eye-catching with a creative design that fully embodies the messaging of your business. And remember, the beauty is in the detail. Think about how you want recipients to remember you long after you’ve handed them your business card. This will fuel the concept, design, and messaging on your card and help you make a lasting impression. If you’re ready to make your business cards stand out and leave a lasting impression, sign up for our newsletter. We’ll send you more tips and tricks on how to design business cards with the “wow” factor.